Some of you may know, my wife and I recently concluded a long journey of cleaning up, with the amazing help of family and friends, two hoarding homes over five years that belonged to my dear departed Mom and Aunt. Often at the conclusion of such efforts there is an estate sale for the remaining, salvageable valuables. I have come to learn that everything goes, including all the ceiling lights. We marked this one ‘NFS’ (not for sale) and indeed it was one of just two remaining lights. 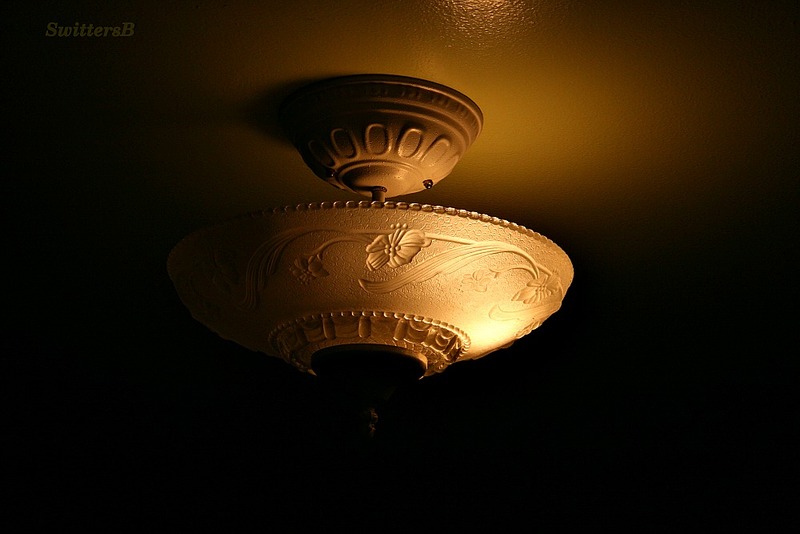 With but one bulb working, the lamp gave off just enough light to show the beauty of the old light fixture. Yesterday, my wife and I were muscling an old, heavy mattress and box spring out of the Hoarding House. First the mattress into a corner. The whole while, Harley was underfoot. Then the box spring was carried out with the frequent “careful Harley’s right behind you”. The box spring went into space and away we were to the next load. The sounds were followed to the matt and box. The box spring was pulled away to reveal the always underfoot Harley! 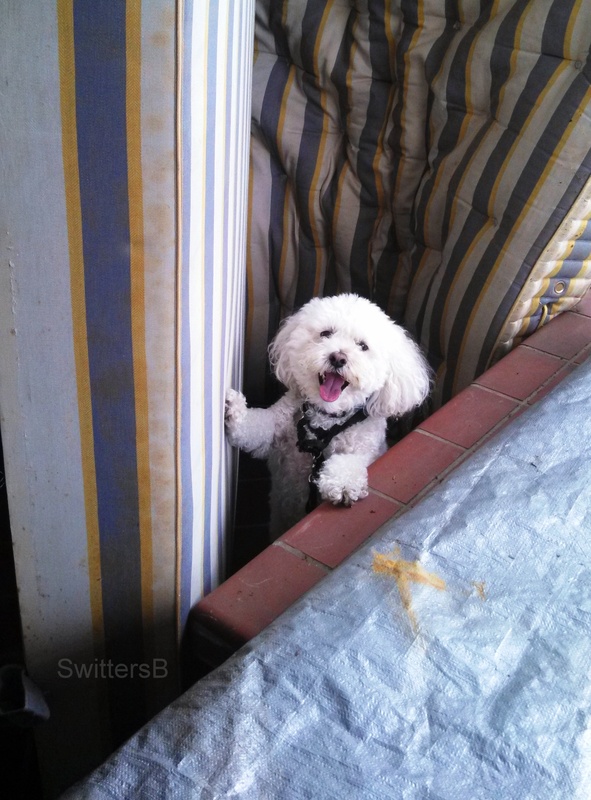 His initial look was one of panic, however, at the point of our laughs and amusement, Harley broke into a grin. With ever increasing portions of our economy, liberty and $$$ going to the Feds, it is disconcerting that so many are eager, almost fanatical in their green fervor, to turn all control, over this green process, to the Feds, and hence all residual portions of the economy. This green folly…a new religion…will be an abysmal failure and have devastating consequences to our economy, way of life and freedoms. And, if the wealthy States of Maryland and Virginia, cannot clean up the notable Chesapeake Bay (no doubt with Fed $ and oversight) then how does one imagine the Feds can manage anything bigger and more complex? Much like taking apart the engine, but not knowing how to put it back together. Easy to tear down. Folly, I say. State and Local Govt’s failed in urban/suburban growth management and by the map charting amonia it is apparent Baltimore/Wash. D.C. really failed. I am sure there is more to this than I presently understand, but one thing is certan, the Feds rarely make anything better. “Inside the Fairbank Tackle shop, men stopped in to grab Tastykakes, cigarettes and long rubber gloves. Others sat down on buckets of Castrol Assuron motor oil, talking politics, crabs, tall tales and old lies. It smelled like Vittorio House Blend coffee, like the dog that people feed Slim Jims and, suddenly, like the worst low tide in history. “What did y’all get into?” somebody asked a fisherman who just walked in, taking a mid-workday break. RANDSBURG, Calif. – Heaps of toxic mine waste rise like church steeples over this wind-swept desert town, threatening the health of residents and of thousands of off-road bikers. Tests on dust samples have revealed some of the highest arsenic levels in the country — as much as 460,000 times the level deemed safe by the federal government. But while the poison can cause cancer in people and harm wildlife, little has been done to remove the costly waste here or similar hazardous waste at thousands of other abandoned mines around the nation. The dozens of old gold and silver mines in the sparsely populated area about 150 miles northeast of Los Angeles are among the estimated 500,000 abandoned mines nationwide that have been largely ignored because of their remote locations. Where has the California EPA and Feds been over the last several decades re these out of sight, out of mind arsenic deposits? What are Alaska’s capabilities of strictly overseeing and monitoring the Pebble Mine project?